Borderlinx | Buy The Hut and ship worldwide with Borderlinx. Cheap rates guaranteed. Mylabel is TheHut.com. A leading online retailer bringing you the best prices on a huge range of products every day of the week. 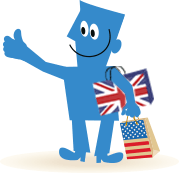 The already extensive range of brands across clothing, toys, gifts, health & beauty, computing, electronics, games, DVD, Blu-ray and much more is constantly expanding plus there's free standard delivery to the UK and Europe. Brands: Adidas, Armani, Chloe, Emporio Armani, EMU, Enta, Enzo, Kate Middleton, L'Oreal, L'Oreal Professionnel, Playstation 3, Nintendo, Wild & Wolf, Wonderbra, Wry Baby, Xbox 360, Xen-Tan, Xplicit, ZAGG, Zirh and much more.